What size is this paper please, i.e A4? Each sheet is 228 x 305mm, which is slightly bigger than A4. 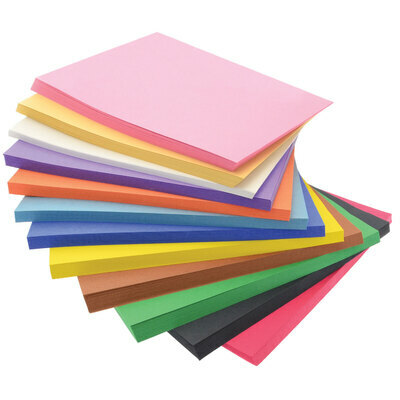 Choose the most economical option for your Stationery needs and opt for our Bumper Value Construction Paper Block. The perfect choice for classes learning about construction and design, this large and economical pack features 12 colours with 54 sheets each of high quality and heavyweight construction paper. Each piece of paper has been impregnated with strong sulphite fibres to help with stability and strength while the high-quality dyes ensure crisp and bold colour. Ideal for modelling and construction sessions, the entire bundle comes cello-wrapped to ensure crisp edges and easy storage in your work environment. An ideal choice for creative classrooms or inventive work offices. We also offer a smaller pack size in our Super Value Activity Paper Asst 200 Sheets for schools and nurseries with less storage. Our Arts and Crafts category is packed with items that will stimulate their imagination and while you're there, take a look at our Children's Smock Aprons for added protection and peace of mind.